There is a food thing in New York City known as Halal Carts. These carts mostly serve middle eastern rice bowls and sandwiches. Of the New York Halal Carts, the most famous is perhaps The Halal Guys. The Halal Guys have a reputation of being really good, but my one attempt to see what they are all about was deterred by the line going up the block. Their countless competitors all serve variations of the same menu with no waiting, so I never actually tried The Halal Guys. Until now. Apparently they have expanded beyond street food and a location was opened in Waterford Lakes. 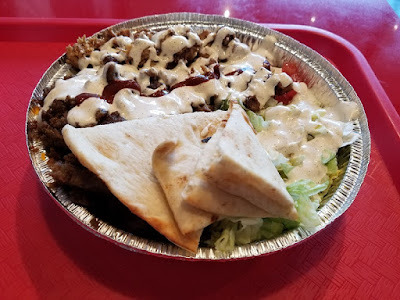 I tried their combo platter which consisted of yellow rice topped with beef gyro, chicken, lettuce, tomato, white and hot sauces, and several slices of pita. Was it worth the hype? It was okay, but I would be disappointed if I waited in a line spanning a NY city block. Both meats were very plain tasting to me. The gyro reminded me of a hamburger and the chicken lacked seasoning. Not necessary bad, but I normally expect a bit more flavor from middle eastern food. 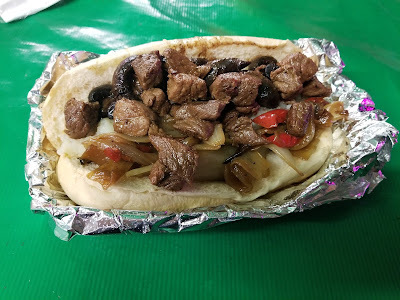 I visited the Central Florida Fair and had some carnival food. I avoided deep fried Oreos, deep fried Twinkies, deep fried bacon, or anything else deep fried and got food from a booth selling steak. The food was being cooked in big skillets and smelled much better than much of the other fair food.